Allspeeds announces the all steel Tangye Hydraclaw jack. This hydraulic jack has a 5 tonne lifting capacity on both the head and toe. The Hydraclaw jack is an important addition to the range of compact jacking options for mining engineers tackling heavy lifts with limited working space. Weighing 18kg (including oil), the Tangye Hydraclaw Jack provides controlled lifting and lowering using the operating lever. It offers a fast lift, 5.5mm lift per stroke, to a maximum clearance of 178mm. The jack’s minimum clearance is 41mm. In addition to smooth operation, the Hydraclaw Jack has a positive stop feature to prevent over stroking, and pressure relief valve to prevent overloading. 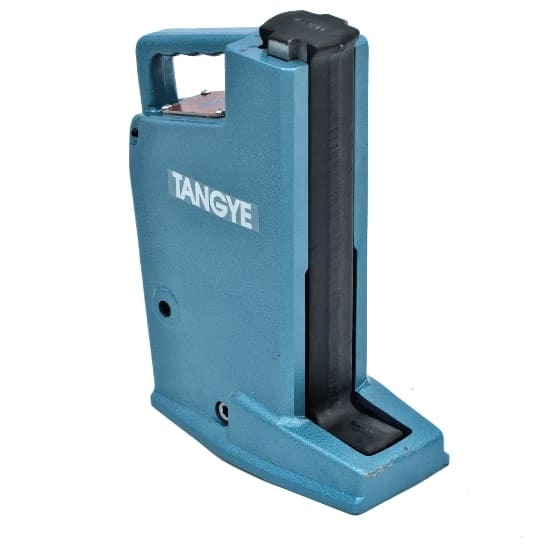 Safety during lifting and lowering is critical and so the Tangye Hydraclaw Jack has a substantial base providing stability under load. The Hydraclaw’s robust construction means it is built to withstand rough treatment on the most challenging lifting projects.